We have been selling and hiring FFA amps since the company’s inception 10 years ago or so. We use these amplifiers over other manufacturers due to the fantastic reliability, amazing sound, and exceptional customer service. As well as stocking FFA amplifiers we also have access to the FFA / NST Audio ID48 Matrix Processors which we have started using on our installations recently. We are big fans of the FFA DSP amplifiers as well and love how natural the software is to use. Very special care and attention has also been paid to the way the software sounds and combined with the reliability of the amps we are completely sold on it. We have installed hundreds of these amplifiers in venues in London and they have a 99% reliability rate. For new sales please call the office or send us an email. We also have some second-hand amplifiers for sale which can be seen on our second hand equipment sales page. We are official dealers so are able to give a favourable price off the RRP of FFA amps. New amplifiers come with a trustworthy reliable 5 year warranty and amps sold second-hand come with at least a year’s guarantee; usually two or three dependant on age. All FFA amps are still in either ex-demo condition or slightly used. We have FFA 4004s, 6004s, 4004 DSPs, 6004 DSPs and 10,000s amps for hire. Please see our FFA amplifier page here. 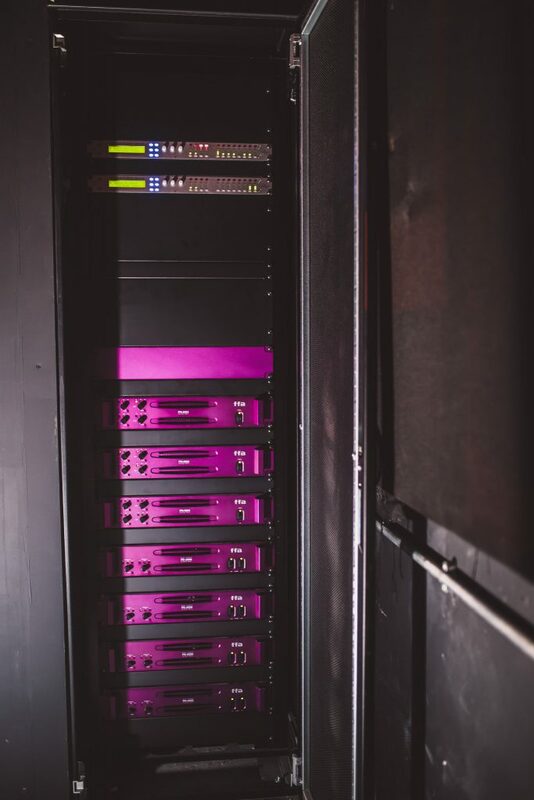 We have singular amplifiers for hire as well as 4 way stereo amp racks which consist of 2 x FFA 10Ks, a FFA 6004 and a Funktion One Xo4A; these racks come complete with a Funktion One patch panel so can easily be configured to run a 4 way Funktion One rig or say a 4 way bi-amped monitor system with for example our Turbosound TFM-450 monitors.